All too often, the everyday, real-life effects of unauthorized status are overlooked in debates about abstract numbers or policies. But a broken immigration system that has more than 11 million people living in the United States without legal status—the vast majority of whom have been here for more than a decade—takes a very real toll on American families. Parents—mostly mothers—have to deal with providing for their children when a spouse is deported, while children face a range of negative psychological and emotional consequences from the fear of having a loved one taken from them. Based on interviews with 81 families, including 110 young children and 91 parents, my recently published study, Everyday Illegal, documents the concrete and multiple costs to American families as a result of the broken U.S. immigration system. These policies affect not only undocumented immigrants, but also native-born citizens and legal migrants. While there are approximately 11.2 million unauthorized immigrants living in the United States, there are an estimated 16.6 million people living in mixed-status families, generally with undocumented parents and citizen children. These families and their individual members pay a steep price from immigration enforcement, as do all Americans. The stories and quotes that follow are drawn from the interviews that make up Everyday Illegal. The U.S. Department of Homeland Security, or DHS, directives on immigration announced by President Barack Obama last November cannot completely undo the damage done to immigrant families—only Congress can pass an immigration reform bill that puts them on a path to permanent legal status and citizenship—but they are a start. The directives will give close to 5 million people the ability to get temporary legal status and to work legally, which will keep families together, improve families’ economic situation, and alleviate the stresses and anxieties of family separation. First and foremost, immigration enforcement separates families. Because deportations are largely a gendered phenomenon that primarily affects men, single mothers can suddenly find themselves struggling to place food on the table and pay rent after their husbands are unexpectedly picked up, detained, and deported. Children in these situations are distraught about their fathers’ inexplicable absences. One mother, for example, described the nightmares her 6-year-old son experienced after her husband was detained. The boy’s nightmares prompted a call home from school when “he was screaming and yelling that his dad killed his mother.” She explained the situation to school authorities, and her son was referred to the school social worker. When fathers are deported, their relationships with their children are severely undermined. It is nearly impossible for these fathers to maintain connections with their children following deportation. Children of undocumented parents, even if their families have not had a parent detained or deported, still expressed strong fears of separation. One 6-year-old confided that she is scared that her mother is an immigrant “because if I am here and my mom goes to Mexico [is deported] I am going to be sad because I would miss her.” Even a 10-year-old, who is a native-born citizen, worries that her mother—who receives biweekly dialysis treatments and would likely not be targeted for deportation—father, and older siblings might be deported because, as she put it, “the policiales are looking for people that don’t have papers to be here.” Such fears breed instability for children, potentially having a negative impact on children’s development. Moises said he has spoken with his cousins about their situation and that they plan to “run away” if his parents are detained. The fear of deportation landed Inés, an unauthorized mother of two U.S.-born children, in a hospital emergency room. A few months prior to rushing to the ER, police showed up at her door looking for her husband, Adrián. His boss had reported that some work equipment had been stolen. The officers took Adrián in for questioning but soon released him. Still, the effects of this encounter and the possibility of her husband’s detention lingered and festered for Inés. Furthermore, immigration enforcement destabilizes the institution of marriage among immigrant families. 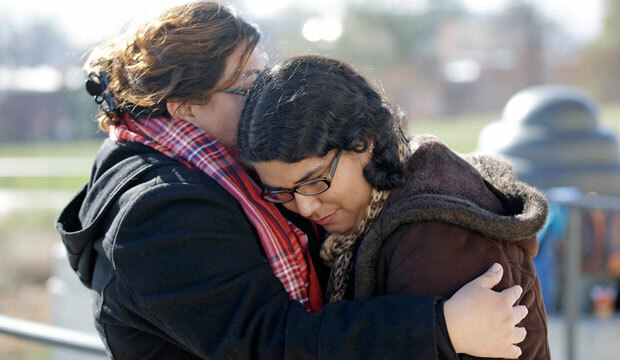 Deportation separates or threatens to separate spouses. Webs of dependency develop between unauthorized spouses and their legal status partners, giving one the ability to yield influence over the other due to their stable legal status and causing an unequal balance of power in relationships. Such unwanted dependencies increase tensions in negotiations between couples, even when it comes to mundane things such as housework and household expenditures. Unauthorized women in abusive relationships are especially vulnerable to such an imbalance of power. To illustrate this point, an unauthorized mother, now separated from her U.S. citizen husband, explained how he used her immigration status to control her. “At any moment he arrives, he grabs the yellow pages and he says, ‘I am going to call immigration right now, the police’ … It is always the same. ‘I’ll call immigration. Then I’ll get my kids. And you’ll go like this,’” she said, snapping her fingers. Finally, the nation’s broken immigration system creates profound inequalities among children. When families have multiple children of differing legal statuses—for example, an older brother who is undocumented and a younger sister who was born in the United States and, as such, is a citizen—siblings face unequal access to health care, extracurricular opportunities, travel, and education. Unauthorized children cannot travel back to visit family members in Mexico, but their siblings can and do. Unlike their authorized siblings, unauthorized children often are ineligible for financial aid and many scholarships to attend college and cannot receive health insurance. Unauthorized 11-year-old Lupe, for example, explained that she and her siblings go to different doctors “because they have those little [state health insurance] cards, they go to a specific doctor.” Lupe said she did not have a card because her siblings “were born here” and she was not. In Lupe’s case, as in so many others, legal status institutes a pecking order of unequal resources and opportunities among children. The November 20, 2014, DHS immigration directives will start the process of alleviating some of these stresses and anxieties. Under the Deferred Action for Parents of Americans and Lawful Permanent Residents, or DAPA, program, parents of citizen and permanent resident children who have been in the country for at least five years will be able to apply for a three-year renewal stay of deportation and a work permit. For a 9-year-old citizen daughter of unauthorized parents who said that she was afraid because she had seen a video of parents being taken away by the police, this new program means she will no longer have to worry about that happening to her own parents. Likewise, work authorization will allow parents to seek better-paying jobs, higher wages, and a more secure economic position for their families. Other provisions of the DHS directives will also help families and young people, such as Rebecca, age 14, who said, “when I graduate I want to try to start my own business, have my own beauty salon.” Until recently, Rebecca worried about whether she would be able to realize her dream, but now thanks to the DHS directives, she qualifies for temporary relief and may, in fact, be able to move forward with her hoped for beauty salon. However, none of these improvements in family stability will be realized if the legal challenges to the directives succeed. Moreover, while close to 5 million people qualify for these executive actions, more than 6 million others will be left out, leaving many families still at risk of separation, economic hardship, and stress. Family-friendly immigration policies that de-emphasize criminalization and instead provide for the legalization of unauthorized immigrants and their families would go a long way toward alleviating these hardships. The nation’s laws should support families and children rather than undermine them. Joanna Dreby is an associate professor of sociology at the University at Albany, State University of New York.